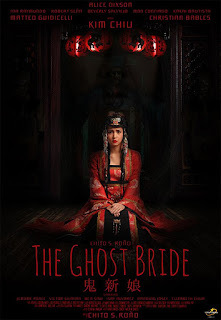 A strange and scary movie starring Kim Chiu and Mateo Guidicelli, Ghost Bride, directed by Chico S. Rono under Star Cinema Productions. Released last November 1, 2017 in cinemas. It all began when unfortunate events happen to Mayen (Kim Chiu), a poor half Filipino and half Chinese was in debt and desperate to sacrifice anything just for the comfort of her family. Until one day, a woman approached her and offered her a lot of money but in return she must marry a dead person. In the old Chinese tradition, it was believed that if a man dies unmarried it is considered bad luck. Out of great desperation, Mayen grabbed the opportunity for the sake of her family. Then the horror starts, Mayen's life turned into an abyss of death. The films is another story that is uncommon, especially it came from a Chinese old tradition, if you're a moviegoer and you watched it you might get confuse because of the unfamiliarity of such tradition. But in the other side it is effectively scary and thrilling. a Must watch for those who are avid of horror movies.